In our DIY guide, we are assuming you are working with lap vinyl siding, or the traditional look of horizontal boards that appear to wrap around your entire home. Vinyl siding offers other variations such as vertical panels, tiles and even a split-wood appearance. The horizontal lap is the most common and our main focus. With that variation comes two distinct types known as hollow-back or foam-back. 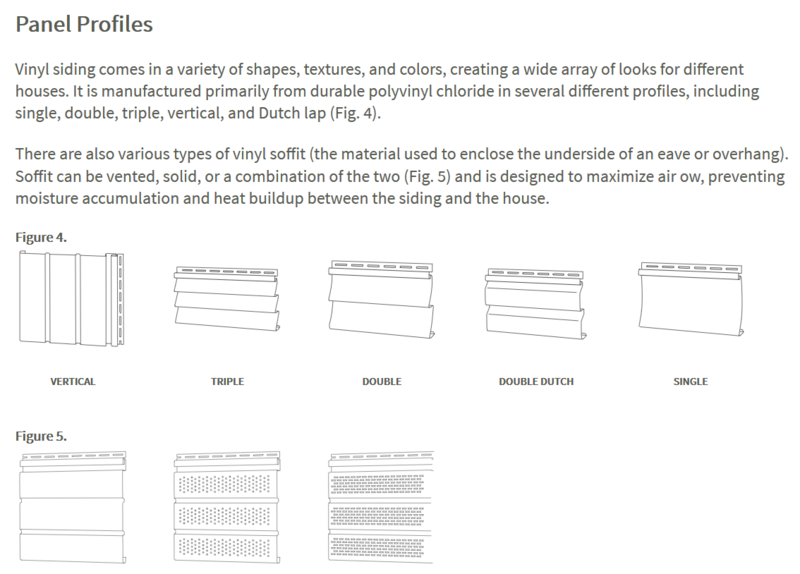 Hollow-back is the most common type and offers enormous amount of variation with colors, width of panels, design or profile of panels type of hem line, and thickness of siding. Standard thickness for residential siding usually ranges from .040 to .046 inches. The thicker the material, the more durable it is, in terms of impact resistance. While these measurements seem very thin, hollow-back vinyl siding is fairly adequate in providing insulation. It scores .61 on the R-value scale. Compare this to say Cedar Shake which scores .9 and is around 10 times the thickness. Foam-back vinyl siding is ideal for increasing the insulation of your home. Better insulation means greater energy efficiency. Foam-back scores 1.8, or three times the R-value of hollow-back. In terms of all types of siding, this is near the top. To put things in perspective, Fiber Cement, Brick and most Stone veneers are all well under 1.0. Besides increasing insulation, foam-back also enhances impact resistance, generally has less seams, and the foam material (EPS) doesn’t absorb moisture. The caveat is, of course, added material cost. Hollow-back usually runs about $1 to $3 per sq. ft. for material. Whereas foam-back costs $2 to $5 per sq. ft. Siding systems must also account for the additional thickness, which may add to overall cost. And waste of materials gets more expensive going with insulated. The tools for the project are all essentially the same, though you’re better off using a circular saw for cuts rather than relying on tin snips. While it is possible to put vinyl siding over some instances of existing siding, we suggest you remove all the old siding. Working from scratch is the first goal of a siding project. This way, you can see if any portion of the exterior walls needs repairs and address that before new siding goes up. Plus, you’ll have better ability to put house wrap along wall studs and create a smooth sheathing for all new siding. Removing old siding can be fairly labor intensive. A professional crew charges between $1,000 and $3,000 for this part of the siding work. The crew will consist of 2 to 6 workers who likely have the experience to complete a tear off in 1 day. 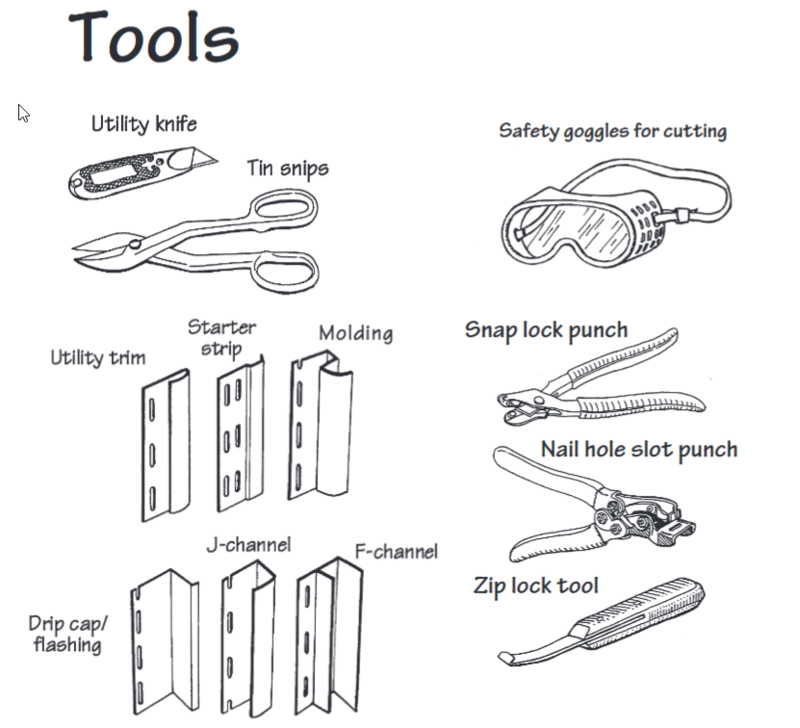 The main tools are: ladder(s), pry bar, reciprocating saw to cut through nails, and disposal bin. The larger disposal bins can be rented and hauled away, but that will run you around $1000. Alternatively, you could lay out large tarps to you put waste onto, or use a utility trailer. Both these options usually mean multiple trips for eventually dumping of the material. With siding removal, it is recommended you start at the top and work down. The first step is to remove all items from the house that can be removed, such as light fixtures, address plates, outlet covers, etc. Special care must be used around windows and any trim that is going to be retained. With regards to utility fixtures and electric meters, you have to work around these. 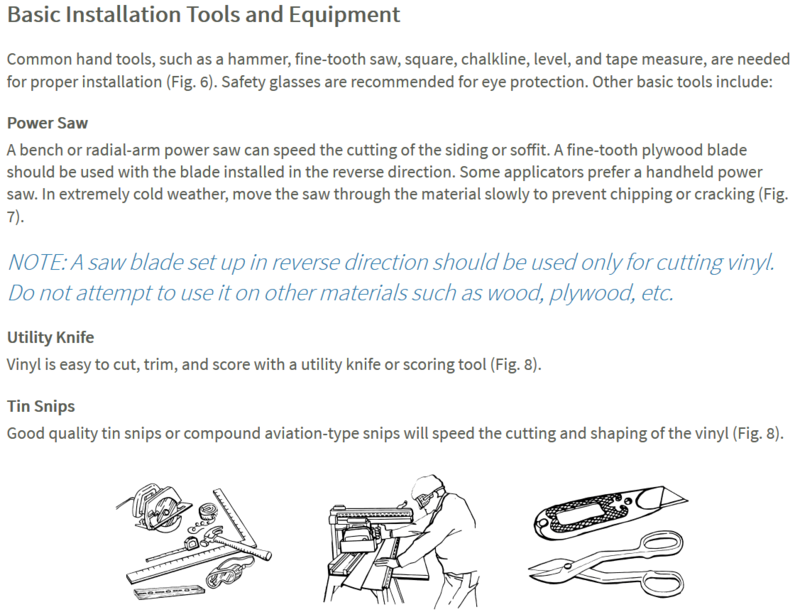 A reciprocating saw can help, but you obviously do not want to tamper with any electrical wires. Then just use the ladders, plural, to have your crew pry off boards, dropping them into the disposal area on your property. Tackle each wall until the project is complete and make sure to clean up all loose pieces and nails. When installing vinyl siding around windows and doors, J-channel strips are usually placed around all edges to fit the siding and hide your cuts on siding panels. Fitting is also known as butting siding boards into channels. 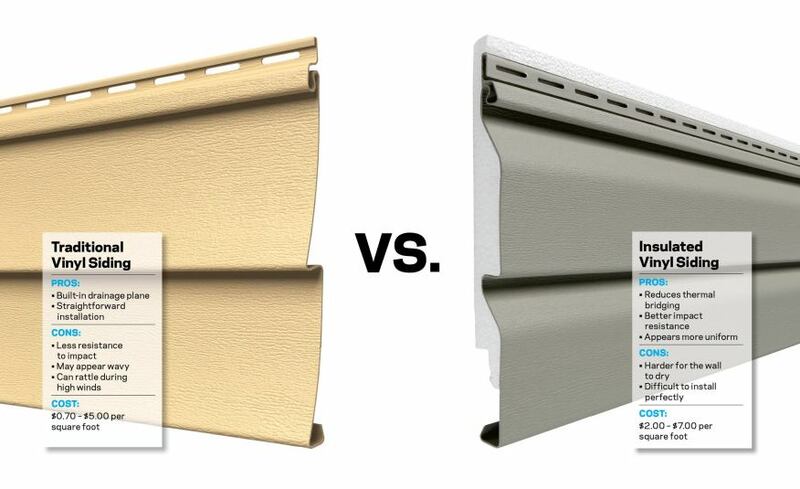 When it comes to economical siding systems, basic J-channel strips are usually included. These amount to about .65 to 1.5 inches of trim. That works and is functional for installing the siding. But it makes for an arguably low quality project. Why not transform the average, basic doorway into an inviting entry? Wider versions of corner posts, window and door trim can greatly enhance the overall appearance of any siding job. Such design options as 5 inch lineal, pilaster, mantels and crown moulding are all possible in vinyl siding and add a majestic appearance. That are all functional as well, proving the J-channel for siding panels to fit into. Typically, a home with vinyl siding recoups about 80% of the cost put into it at the time the home is sold. This amounts to a very good ROI. Adding high quality trim will routinely increase that number. For better understanding on making quality trim work, see this article from Georgia-Pacific Vinyl Siding & Accessories. Going the DIY route allows you to make a conscious decision on the trim you find most appealing and to use it throughout the home’s exterior. 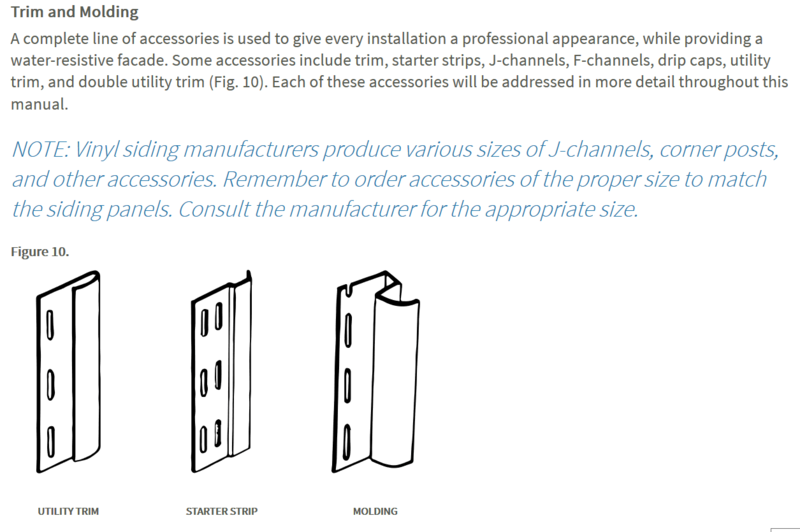 In our guide below, where we reference J-channel pieces, you can substitute that with quality trim pieces. 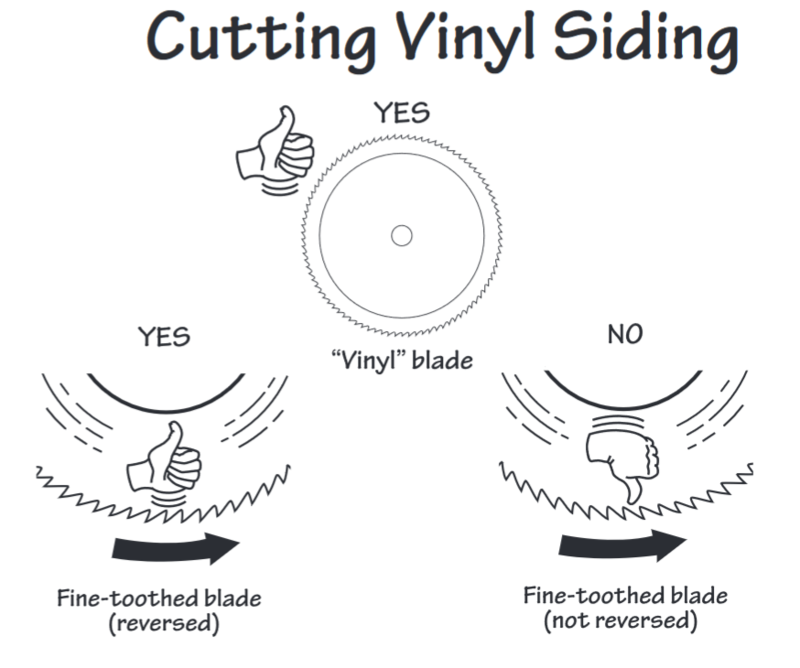 Ply Gem provides a few examples of vinyl siding and related accessories. The preliminary steps for installing siding are measuring, leveling and fastening trim pieces to the house. Measuring and trimming are the exact science portion of the job while fastening trim entails the art and skill that makes for premium quality. You’ll always work on one wall at a time. So first measure length of outer counters from eave to foundation. Similarly, if the wall has an inner corner, measure that vertical line from upper point to foundation. Next, measure gable lines, or from roof peak on the eave side, along the rake, to where outer corner meets lowest part of the eave. Write these measurements down. Additionally measure width of the wall along the bottom edge, at top of the wall where the gable starts and then overall height of the wall from eave to ground. Next cut J-channel strips based on the measurements for every edge except outside corners. 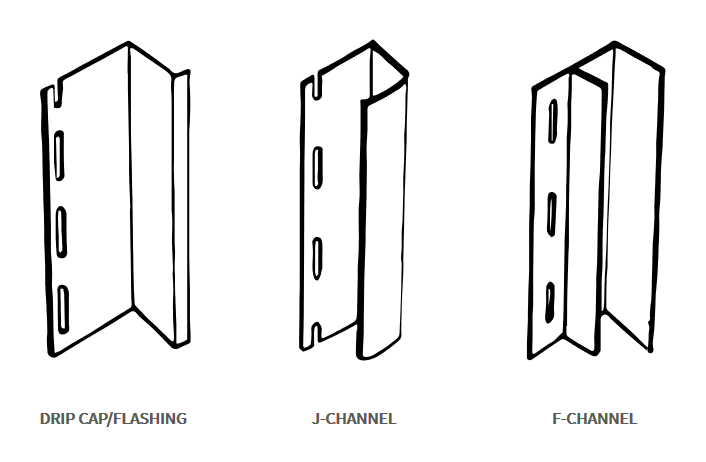 J-channel is what edges of siding panels fit into. Corner moldings also have J-channel as well as the molding that enhances the visual appeal of the overall siding, framing each wall. Next, you’ll cut 2 corner moldings a 1/2 inch short of the measurements you made for outer corners. Then prepare to attach the corner moldings. Because these are what frames the siding, it is critical they be plumb, or aligned exactly to the vertical edge of the house. To prepare for accurate attachment, use your level and chalk line to assure vertical precision. Lines on both walls that the corner piece will be attached to is suggested. Then you’ll attach the corner piece on either side of the current wall. Start at the top and fasten it on both sides every 10 inches or so. Along the way, double check that you are maintaining straight alignment. Attach the other corner post with equal care. Next attach the J-channels strips along the roof line. Measurements on these strips need not be as precise as corner pieces. Where precision matters here is mitering of the two pieces that meet at the peak and along the edge of the corner posts. Mitering is as simple as cutting pieces, with tin snips, at an angle so everything aligns with a snug fit. By this point you should be done with fastening all trim pieces for the current wall you are working on. Additional preliminary steps are for adding trim to all objects or openings along that same wall. Final part of the preliminary steps is the starter strip. First prepare the wall with two considerations. Placement of the strip is typically an inch or two above the foundation. The measurement you took at center of the wall from roof peak to foundation will help determine if siding panels will be exact or if you’ll need to specially cut a piece to make it fit at the gable peak. Sometimes, vertical adjustment of the starter trip can help, but more often you’ll need to plan on it not being exact. If the measurement is say 18 ft, and your siding panels are 10 inches each, then you’ll be able to fit 21 panels along that wall with 6 inches left over, so the final panel would need to be specially cut. The second consideration is to ensure the starter piece is exactly level. Using your level, use a pencil to mark off a level line an inch or so above the foundation. When that’s done measure exact length of that line to the foundation, and proceed to move down the wall making similar markings at same length. Then snap a chalk line along your pencil markings. Double check that line to ensure it is level. You are now ready to install your siding panels. 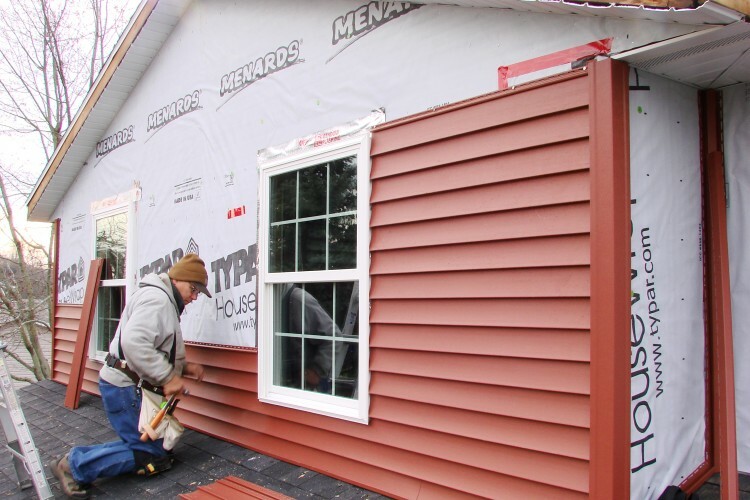 Installing siding is relatively easy compared to the first preliminary process. It is time consuming and there are certain caveats to keep in mind. The two biggest are that unlike trim, siding is never fastened to the wall. Instead it is hanging on the wall. When pieces are nailed via the hem line, you will never want to make it so the panel can’t slide left to right. Vinyl siding needs allowance to expand and contrast due to temperature changes. So nails are hammered straight (never at an angle) and a gap of 1/8th inch is left between panel and nail head. The second major caveat is that pieces are always cut short. You’ll always want to measure each piece before cutting, and not assume that your corner posts are 100% accurate. So, if width of the wall is say 10 feet 2 inches, and your panels are 12 ft in length, you’ll cut each piece to 10 ft, 1.5 inches. The exact allowance will depend on what the siding manufacturer notes, but usually it is around a half inch, which translates to a quarter inch allowance on each side. Now, if your wall is say 20 feet in length and you’re working with 12 ft. long panels, then you’ll need to overlap pieces to have it fit. This is where ingenuity comes in. Overlapping seams ought to never line up as that would be fairly visible from a distance. 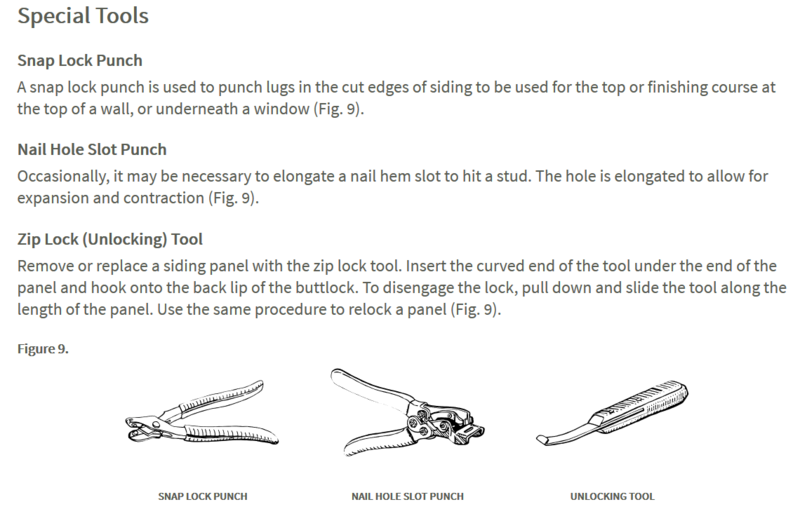 So, you’ll cut panels at different lengths to vary the distance at which seams will occur. Another pro tip is to consider the piece that will overlap on top. The idea is that seams are visible from one angle and very hard to detect from another angle. Pros go with maintaining overlaps that are away from street view. So panels closer to the front wall go on top. On the front wall, you’ll make a decision based on which side of the house gets more foot or vehicle traffic. Once all that is considered, the process of hanging siding entails cutting out measured lengths and snapping bottom edges to lower pieces. The starter strip has it’s own edge to snap the first piece to, and each piece after that provides a strip to snap the piece above it. Another pro tip is the vertical adjustment you’ll give each piece as you work your way up. The hem line is a small gap, but will budge just a little bit, and enough that you can pull up slightly before nailing each piece. Nails along the hemline can be every 2 to 3 feet, and each time you’ll want to pull up slightly before nailing the piece to the wall. Ideally, you’re using your stud finder to nail along the studs. Inserting pieces around windows, doorways and fixtures takes a bit of practice and special cutting. You’ll essentially want to cut the hemline out and insert the cut portion into utility trim pieces to ensure that those aren’t flapping in the J-channel on windy days, along the window’s edge. Along window and door sides, the process is essentially the same as for corner post J-channels. When you get to walls with gable ends, you’ll cut your panels at the angle that matches the roof’s pitch. The gap allowance on each side of the panel is still in effect. When you get to the top, you’ll specially cut a panel so that there is likely no longer a hem on that piece. For gable walls, you’ll end up with a pointed piece that can’t fit into any channel and expect to stay there, so you’ll use a small head nail to fasten that to the wall. For walls where the eaves are parallel to the ground, you’ll use a utility strip to snap the specially cut panel into that trim. Once the first wall is done, the rest of the job becomes easier to understand and complete. Your first time installing vinyl siding on a home will probably introduce unique situations around every corner, or on particular walls. It’s important to take a moment to think things through rather than doing a rush job that has poor results. Pros work efficiently, but that comes with lots of practice. It’s often good practice to pause along the way and take a wider view, checking how the whole wall is coming together. The goal is to align siding that is level and installed with care. When the job is done, relax and enjoy your new siding. Some considerations to consider going forward are annual cleanings. See this article for how to go about that. Also be on the lookout for panels needing special attention or repair. Popping panels out is relatively easy and new ones can be put in. Keep in mind, the color of pieces will be different as sunlight will cause colors in vinyl to fade ever so slightly. Another caveat with vinyl siding is that it doesn’t fare so well under intense heat. This is a non-issue from direct sunlight, but a neighbor’s window coated with Low-E can reflect sunlight in such a way as to overheat, and ultimately warp vinyl siding. This is actually quite rare, but it does occur. Moreover, if you enjoy cooking outdoors on the grill, be sure to keep that a good 10 feet or more from your walls. Intense heat from the grill will possibly damage the siding if left too close to the wall. Besides, the further you are away, the more you can appreciate the craftsmanship of your home’s vinyl siding.